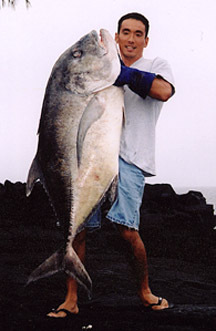 Dale Nakamoto was shorecasting on the East Shore of the Big Island on February 15, 2004 when he hooked his 100-pounder. The big fish ate a tako that Dale had slid down his 80-lb line. Dale's shorecasting setup consisted of a Talon CY026 pole and a Newell P454F reel.